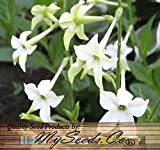 Tobacco plant growing herbaceous of the genus Nicotiana also known as Nicotiana tabacum, Tobacco plant annual used as ornamental plant, can grow in mediterranean, desert, subtropics, temperate, tropics climate and growing in hardiness zone 5+. Flower color pink-white the flowers grow in clusters. Pink-white flowers, the flowers grow in clusters.